This is the story of how we inspired women to take action and their communities to help them have safer pregnancies and healthy babies. When Hawwa was pregnant for the first time she and her husband didn’t make plans for the birth. This wasn’t what people in their rural community in Ethiopia did. Hawwa had a difficult and long labour. She ended up being rushed to the nearest health centre where her baby was born early, though fortunately survived. Hawwa felt she didn’t receive good care at that health centre. Many hundreds of women die from pregnancy or childbirth-related complications around the world every day. And the majority of all newborn deaths occur during the first week of life. At BBC Media Action we know deaths like this can often be prevented. During her second pregnancy, Hawwa received useful advice from the community health worker. She and her husband also enjoyed listening to BBC Media Action’s radio programme, Biiftuu Jireenyaa, which means “Dawn of Life” in Afan Oromo. They said they found it entertaining, inspiring and helpful. They decided to do things differently. Hawwa went for regular antenatal check-ups with her husband. He also saved money, arranged for a safer home delivery and for transport to take her to a health facility in case of an emergency. She carried the baby to full term and had an uncomplicated birth at home. 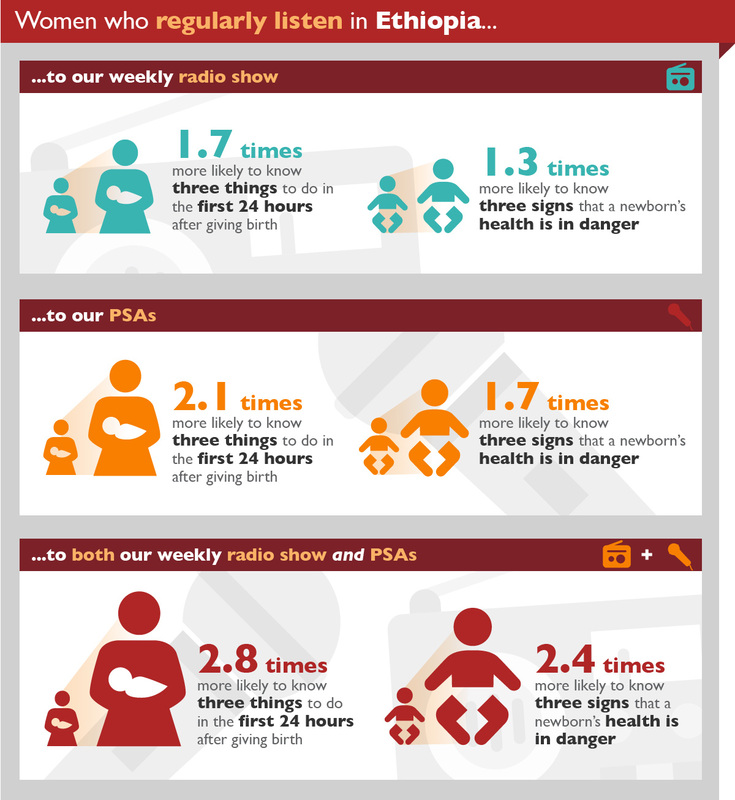 This is just one example of how BBC Media Action’s radio programmes motivated people to believe they can and should act differently to have safer pregnancies and healthier babies. 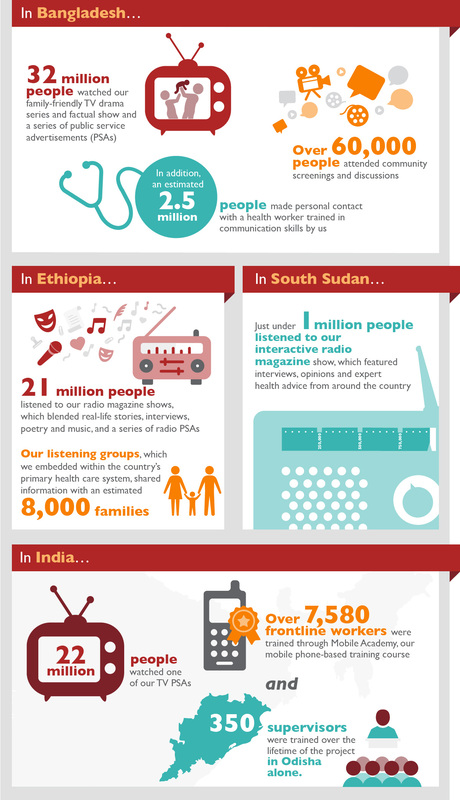 Around 93 million people watched or listened to our health programmes across Bangladesh, Ethiopia, India and South Sudan. Between 2012 and 2016, BBC Media Action reached millions of mothers and mothers-to-be, along with their husbands and mothers-in-law, in Bangladesh, South Sudan, the Amhara and Oromia regions in Ethiopia, and the states of Odisha and Madhya Pradesh in India, with radio and TV programmes. Our drama and factual shows featured real life or fictional stories of families ‘just like them’ dealing with pregnancy and parenthood. Trusted health experts also shared information about healthier practices and available services through these shows. The programmes were backed up by public service advertisements and community events that sparked discussion about different ways of thinking, feeling and doing things. We focused on a number of key practices that are known to have a positive effect on the health of pregnant women, babies and infants. We knew it wasn’t enough to target women alone if we wanted change to happen. We also aimed to engage those with a strong influence over the choices women make regarding their health and parenting. This was the only way to ensure we could transform maternal and newborn health outcomes. Formative research carried out at the start of BBC Media Action’s projects in Bangladesh and Ethiopia indicated that people believed care in pregnancy and birth preparations were the ‘woman’s role’, with the mothers-in-law, particularly in Bangladesh, overseeing this. Men were rarely involved. The mother-in-law was likely to advise her daughter-in-law according to her own experiences and what had always been done in her community or society. In both Bangladesh and Ethiopia this means giving birth at home. Using these insights, BBC Media Action project teams in Bangladesh and Ethiopia developed effective strategies to appeal to and encourage these influencers to do things differently. We wanted to go further. We also wanted to engage women, families and communities who had no access to TV, radio or mobile phone. So we joined forces with government and non-governmental organisations (NGOs) in Bangladesh, Ethiopia and India. Mass media programmes were adapted and used in weekly radio listening groups, in community outdoor cinema screenings and in one-to-one exchanges. Health workers used mobile content to reach, engage and influence families. Importantly, these activities generated the discussion needed for change. They helped to engage people who might not traditionally be interested in the health of women and babies, like men. And they helped good-quality health communication to become woven into the fabric of local health systems. Our Practice briefing: A bigger splash – partnering for impact further explores these experiences and lessons. And this Research Summary explains how listening groups added value to the work of the Ethiopian Health Development Army and had an effect on the wider community. Data analysis shows that pregnant women and new mums in Bangladesh and Ethiopia who watched or listened to our programmes were more likely to follow safer and healthier practices during pregnancy, birth and the early years of a child’s life than those who didn’t watch or listen. The analysis showed that the actions they took were not related to factors like their wealth, education, access to health services and other important ‘confounding’ factors. This allows us to be more confident that it was our TV or radio programmes that had prompted them to take action. In Bangladesh, our TV drama depicted the first birth scene in Bangladesh TV history. This enabled us to demonstrate safe delivery and newborn care practices. Mothers who watched our TV programmes in Bangladesh were more likely to have skin to skin contact with their newborns and more likely to delay bathing their newborn – which is essential to prevent hypothermia. This frequently asked questions document explains the method of analysis we used to understand impact of our health programmes in Bangladesh and Ethiopia. Our final Bangladesh and Ethiopia evaluation reports provide in-depth analysis of how these projects improved reproductive, maternal and newborn health using health communication. In India and South Sudan, our research shows that listeners and viewers said the programmes had an impact on their lives. In India, one of our public service advertisements, Ek Teen Do, was designed to persuade families to leave a three-year gap between pregnancies. Our research shows that one in five women who saw the advertisement said they discussed birth spacing with their spouse and one in 10 said they visited a health facility for family planning advice. While, 4% of women said they went to a health facility to get contraception. In South Sudan, where conflict and extremely limited health services pose major risks to the lives of mothers and babies, listeners to our radio programmes said they learned new ways to stay healthy and minimise risk. Despite the challenges of gathering data, we discovered that women had made changes such as taking rest during pregnancy or exclusively breastfeeding their babies – and they attributed these changes to listening to our programmes. Our final South Sudan evaluation report provides in-depth analysis of how this project improved maternal and child health through media. We learnt a number of things from this work. By using varied media formats and communication platforms to influence people in different ways, we had a greater impact than if we had used just one. We also carried out a randomised control trial in Bangladesh that revealed women who watched our health drama and supporting talk show knew more about and were more likely to say they planned to follow safer and healthier practices than those who had only watched the health drama. The findings are in this research briefing: Can a health drama and discussion show affect the drivers of behaviour change? The film below explains the “theory of change” that lies behind our health programmes and the evidence we have that simply increasing a person’s knowledge was not enough to compel them to adopt safer and healthier practices. It was important that people also discuss the issues with family and friends, believe safer and healthier practices were becoming common in their community and develop a positive attitude towards them. Overall, viewers of our TV programmes in Bangladesh were more likely to be knowledgeable about safer and healthier practices, to discuss these issues with friends and family and to have more progressive attitudes and beliefs than those who didn’t watch the programmes. The research shows a similar pattern for our radio listeners living in rural and remote regions of Ethiopia. 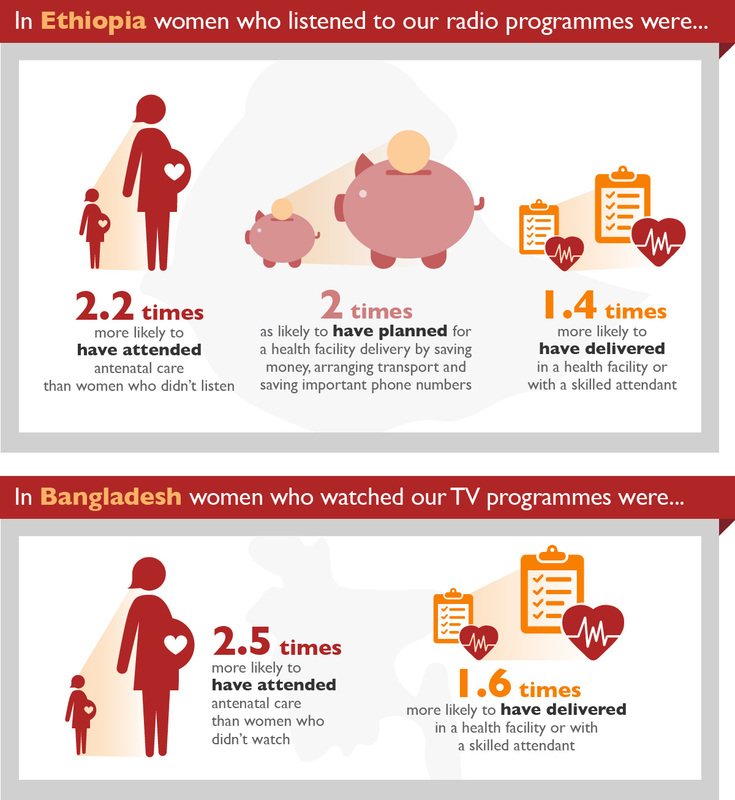 Unlike in Ethiopia, women who watched our TV programmes in Bangladesh were no more likely than those that didn’t watch to go for the recommended check-ups in the first three months of pregnancy. We think the prevailing social norm around keeping pregnancy a secret in Bangladesh made this more difficult to achieve. In Ethiopia, data suggests men who listened to our programmes were no more likely than those that didn’t to report using modern contraceptives following the birth of a child. People who regularly attended our village listening groups said they felt able to discuss contraception within the group because it was a secure environment. This suggests that enabling more interpersonal discussion could be valuable in encouraging contraceptive use. In South Sudan, the realities of displacement, dire poverty and scarce health service provision made it difficult for some listeners to adopt healthier practices covered by our radio programmes, such as going for regular antenatal care check-ups and giving birth at a health facility.